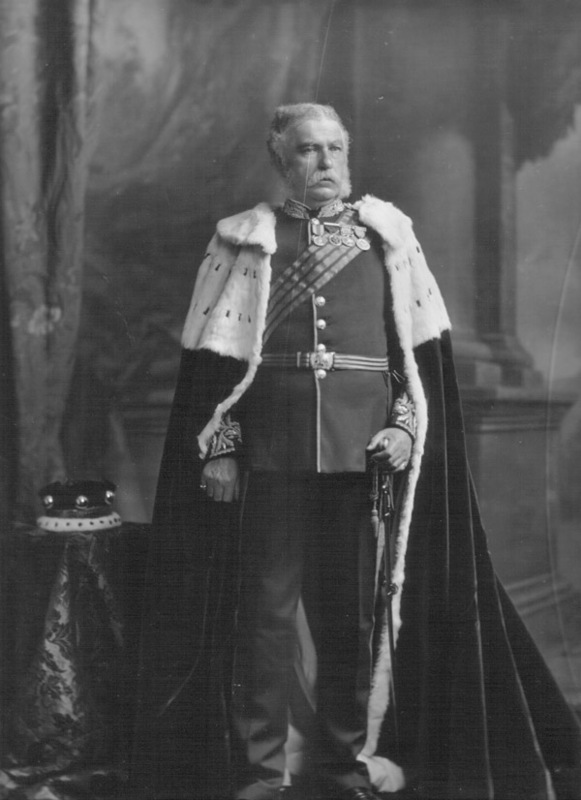 Josslyn Francis Pennington, 5th Baron Muncaster (1834-1917). Sitter: Josslyn Francis Pennington, 5th Baron Muncaster (1834-1917). Biog: Crimean War Veteran; Conservative M.P. ; Lord Lieutenant of Cumberland; Director of the Furness Railway Company. Costume: Peer's robes over Dress Uniform, Lord Lieutenant (English County) [old pattern]. Orders, Decorations & Medals: Queen Victoria Jubilee Medal; Volunteer Officer's Decoration; Crimea Medal; Turkish Crimea Medal 1855 (?). Biog: Burke's Peerage; The Complete Peerage; Who's Who; The Times, 31 March 1917, p.3b. Orders, Decorations & Medals: (Jubilee medal) Howard N. Cole, Coronation and Royal Commemorative Medals 1887-1977, London, 1977; (Volunteer Officer's Decoration) A. R. Litherland and B.T. Simpkin, Spink's Standard Catalogue of British Orders, Decorations and Medals, London, 1990; (others) E.C. Joslin, A.R. Litherland & B.T. Simpkin, British Battles & Medals, London, 1988.